There’s no denying that Marcos was one of the most advanced thinking presidents the Philippines had. Economically, technologically he did a lot of good (w/c we still benefit from and will benefit from). Am I a supporter of Marcos burial in the Libingan ng mga Bayani? I am not. But that doesn’t mean I am taking political sides. Honestly, I am at awe at how intelligent he had been and I am happy with the advances in urban development he spearheaded. But the gravity of the consequences of his declared martial law somehow outweighed all the greatness he accomplished. Technically, he never hurt the victims. It were the people who abused their granted powers then who did. Nonetheless, his decree incited ruthless acts and the outcry of the masses is far too heart wrenching and overpowering that his systematic achievements as a Philippine President had been toppled over. As a result, the surprise Marcos burial in the Libingan ng mga Bayani led the people to the streets again. Though the intention was sincere, we still can see different political agenda being inserted into the matter. Pathetic. I am not pro this nor anti that… I am pro Filipinos having a good life they deserve. Then here comes the challenge. Marcos was the proponent of the law that states that every employee must be given a “13th month pay” by the end of the year—that is a type of wage bonus about one to two months worth of salary. Now, people say that if you’re against Marcos burial in the Libingan ng mga Bayani, you must not accept this bonus to show how strongly principled you are. As former President, it was his obligation to help produce a quality life for Filipinos. Thus, passing of this law was his duty. More so, originally, the workers included in this decree were only those earning P1,000 and below a month. After his reign, it was amended by the Cory Aquino administration to be granted to all employees regardless of income. As such, it is then a combined effort from two different Philippine Presidents and since then has become a basic right of the working class. So, if you’re anti the LNMB burial, should you give up your 13th month pay? Not necessarily. A right is different from bribery. Why should you give up the privilege that is rightfully yours especially your bonus is the fruit of your hard annual labor? Yes, he was the proponent but it was because he ought to. Should we accept this challenge, it then must be equal to not using the public highways and technically not being part of anything today that stemmed from Marcos’ economic partnerships and projects with other nations. Where would Filipinos go then, when every economic or national gain we have today has built up on top of each other that it will be plainly difficult to label them as achievements of a particular administration only? With this, the blueprint of Filipinos’ way of living after the martial law is the result of the democracy and is the payback from all the shortcomings and the horrors of that period brought upon to the people. Again, as a former President, Marcos was great. But not all great people produce only great things. If you are given a share of something legal you worked hard for, it is lawful and moral. There are logical boundaries to what we deem righteous—it’s relative. Stop judging people who disagree with your beliefs. Halt from challenging people to prove what they are fighting for. 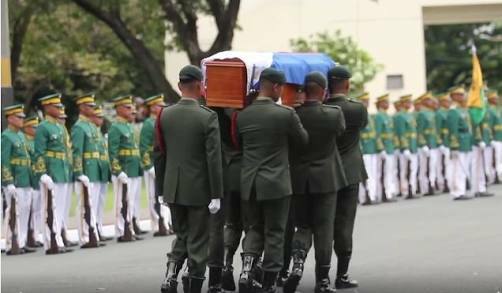 Basing from legal criteria, Marcos’ burial in the Libingan ng mga Bayani is legal. He was a president and a soldier. However, in the judgment of people who lost loved ones who never get to know what happened to their children, wife, husband, sister, or brother, it is a spat to their loss and pain. While Marcos is finally laid to rest, their wandering minds continue to ask lingering questions—where is s/he? When can I build a tombstone in my beloved’s name? Yes, we must forgive. We must forget. But how can we possibly forgive when forgiveness was never asked? How can we forget, when the very same right to a decent burial that was given to a deemed dictator was never granted to victims we would never know what happened with? 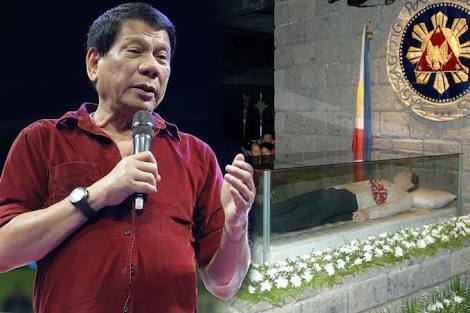 Though a name maybe just a name, it cannot cover the fact that among the heroes who fought against terrors in society, The President who incited public hysteria was laid to rest with them. Perhaps, our definition of a hero is flexible. Depending on the ideals that are favorable to whoever’s in power.